I don't always love my job and there are many days where it just feels like I've been at the office for a whole 24 hours and it's not even close to 5 pm when I look at the clock. I realized these are usually the days where I'm the least productive, I'm the most bored and even more sleepy than usual. There are just days where the motivation is just NOT there, where we just show up to work because we got bills to pay, or the days we had a rough night and it's going to take us a couple- yes, a couple of cups of coffee before we can get our life together. We all been there- trust me. I will rush everything (to meet the deadlines). - Which means I will make mistakes and do a sloppy job. I will literally lose my mind. - I need to be occupied to be able to stay sane, if not I'll start to lose it. I'm wasting my time and everyone else. - We all aim for the day that we can get paid for doing absolutely nothing, or making money in our sleep and so on, but when you are still working a 9-5 and you're not doing what you're being paid to do, exactly why are you there? 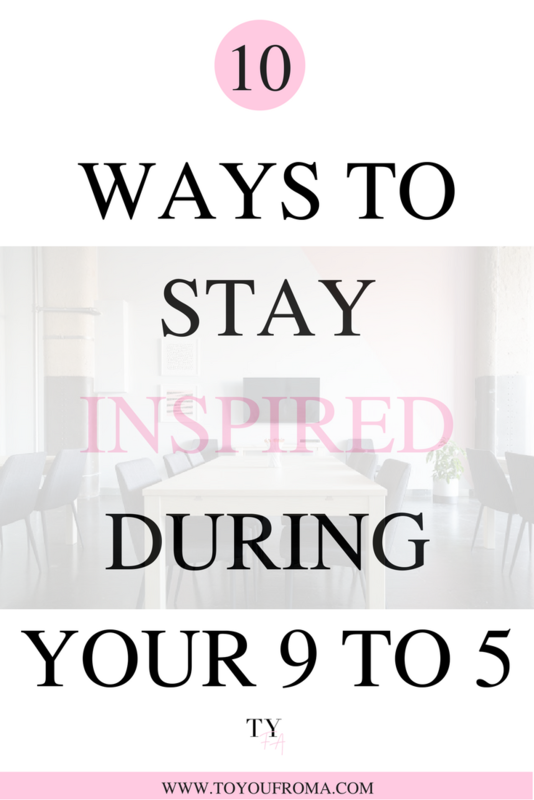 Because I actually like to get the best use of my time (for the most part, if we are being honest) and do what I'm being paid for, I have found different realistic ways to stay inspired and motivated during my 9 to 5 - every day - because we need to. 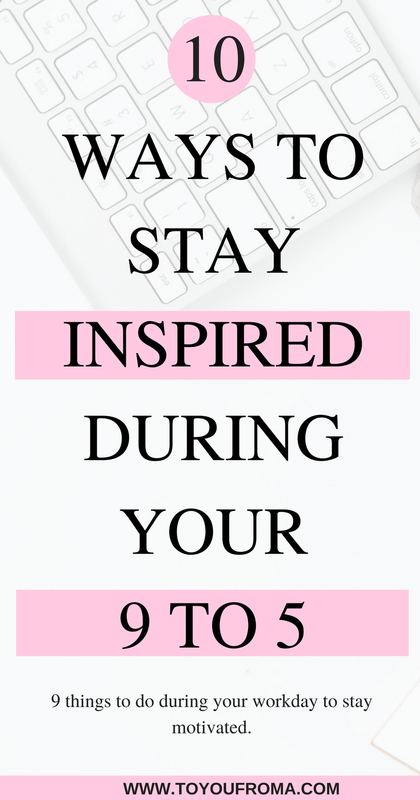 If you are feeling like you're running out of ways to stay inspired during work, keep reading - this post is for you. Unless I'm crazy busy and I need to be laser-focused I'm listening to a podcast or some music to keep me going. I work in a cubicle so I have the advantage to be able to put my headphones on and block any noise that surrounds me. I usually can't work hearing everyone and their momma typing their lives away or having side conversations. My current favorite podcasts to listen to and be inspired are; "#Girlboss Radio" and "Women, Work and Worth". I also listen to "The Breakfast Club" when I want to laugh and stay up to date with the celebrities. 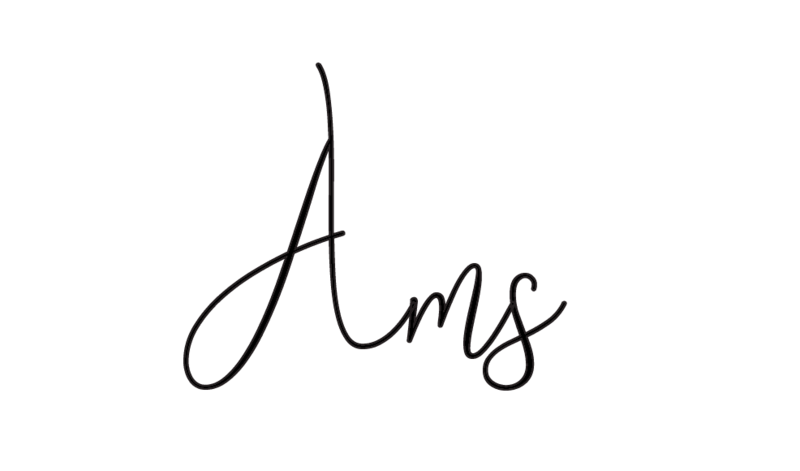 My girl over at Signed, Logan has a whole post on Motivational Podcasts for the girlboss, you can read it here. I'm very guilty of not doing this but it's so necessary and so important for you to take your full 30 mins or hour lunch break to be able to stay inspired and sane at work. Use this time not only to eat but to also refresh your mind with things that are not work-related. I know bloggers/ side hustlers use this time to be active on social media, write posts, plan out strategies and so on. Use this time for whatever it is that your heart desires. If you want to spend a whole hour on Pinterest and Instagram? Go ahead. Watch some Youtube videos? Go ahead. Have a conversation on the phone? Go ahead. Your lunchtime is YOUR time, use it however it will benefit you the most! You are entitled to two 15 minute breaks aside from your lunch break during your eight hours at the office. - Take advantage of this time. Break your time accordingly throughout the day and have a quick walk outside for some fresh air or if it's too cold just take a quick walk around your building. 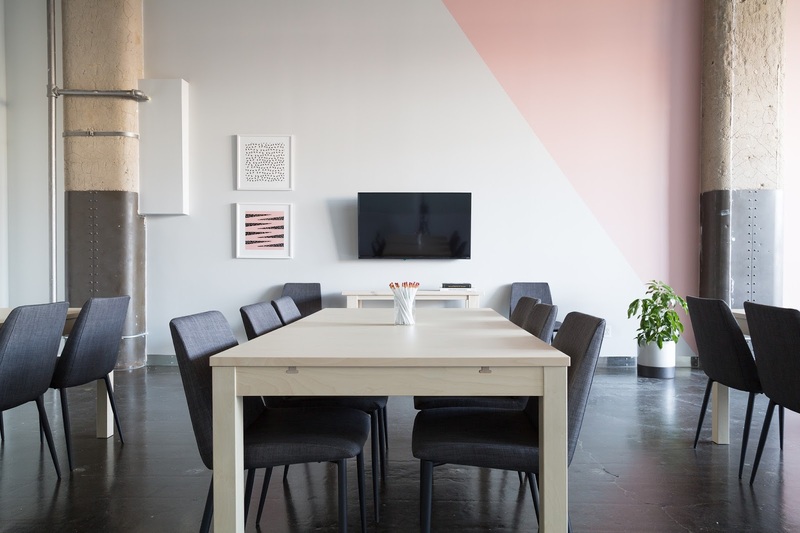 TIP: Taking a walk around your building helps you get familiar with your office and the people that you work with. ANOTHER TIP: Don't just take walks every 5 minutes, taking too many walks will not only make you look bad but also take away from your day and productivity. A good balance is to step away when you need to "refresh" your mind right before moving on to another task. There is something about knowing what I need to get done and having it in front of me that just makes my life easier. I'm more of an old-fashioned so I write everything down, physical calendar and weekly to-do list. This way I know what I need to get through during this day and the meetings I have scheduled for the day so I have an understanding of how to utilize my time in between. TIP: If you use Outlook at work you can print a day, week, and whole calendar version with your meeting and tasks. This will show you per hour where you should be at exactly or when something is due. I usually print my busiest day- the ones that are full of meetings so I know where to go and have a print version of what my day looks like. This goes back to the point above, being organized. When we know what needs to be done and by when we have an understanding of what to focus on. 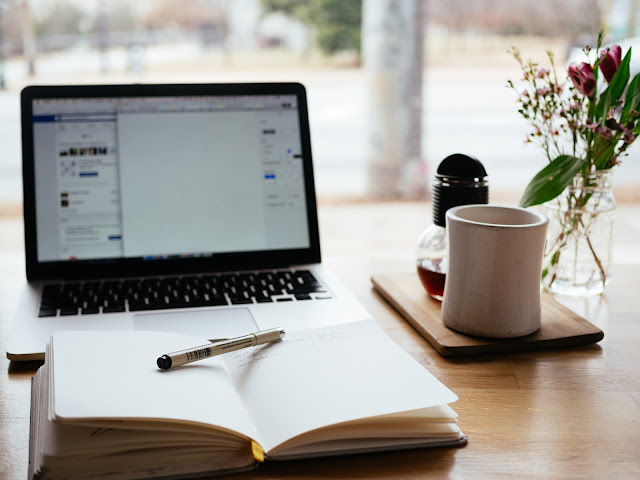 Block scheduling is the magic of just working on one thing at a time and not moving on to anything else until it's done or until the time designed for it its up. I also added the don't look at the time part, because when we are focused and not being distracted (with when is going to be 5pm) time actually works to our advantage and moves faster- or so it feels. Next thing you know it's 5pm and it's time to go home. 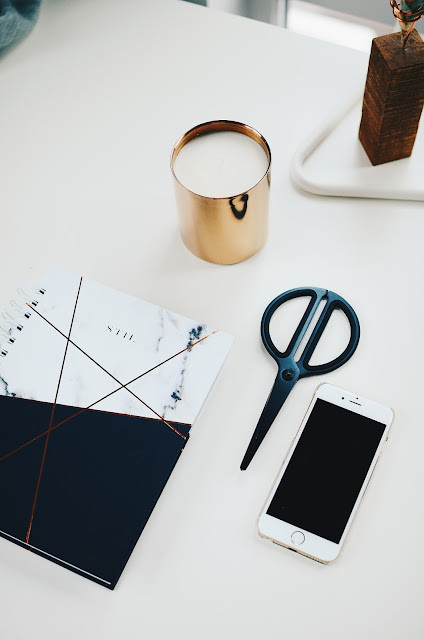 My girl Sheila from insearchofsheila.com shared a whole newsletter back in January on how she stays organized during her 9 to 5 and re-introduced to me the magic of Block scheduling. TIP: Finish everything you dread doing first thing in the morning. The morning is usually the time we have the most energy. ANOTHER TIP: Create timers while you are working, this will help you keep track of time and force you to get everything is done within the time that's blocked for that task. To stay inspired, you need inspiration, motivation, a theme, a vibe. Which means having an office space that gets you in the zone is a must. I'm currently living by the quote "Be so good they can't ignore you" because it's not only inspirational but also a reminder to stay focus because there are goals to meet. TIP: Decorate your office space however you want (as long as it's work appropriate). We spend more time at work than we do at home. Make your workspace, the space you actually enjoy being at. It's a fact that how we start our morning affects how our day goes. I don't know about you, but I need to have a good breakfast every morning and my cup of coffee to be able to tackle my work day. I'm unable to function without a cup of coffee or food in my stomach. Remember breakfast is the most important meal of the day - and that's a fact. TIP: Make your coffee/tea at home to help you wake up and save some money. It all goes back to how we start our morning before we step into the office. If we are happy on our way to work we will still be happy once we get to work. Create a routine for your commute that you will enjoy. This will include; good music, coffee/tea, relax while driving/riding, a good book, etc. TIP: Do something that will bring you happiness in the morning, something that will set the mood for the rest of the day. There is nothing better than knowing you are appreciated at work and that others see your potential and hard work as much as you do. Having a 1 on 1 with your manager or mentor on a regular about your future and career goals will not only help you stay focus but also inspired you to do more, want more, be more. Build a relationship with those that show you they have your best interest at heart and learn from them. TIP: Schedule your 1 on 1 weekly or biweekly and discuss different topics. The more you are able to express your needs and wants to your manager and understand what they expect from you, the better it will be for your end results. If you know what it's expected of you, you know what needs to be delivered from your part. To be able to achieve your goals you have to know what they are- right? When we have a clear understanding of where we want to go, and how we are going to achieve them we are instantly more motivated and inspired to get it done. At the beginning of the year, I sat down and wrote down my career goals for 2018. I also identify my (big) long-term goals. On the first 1:1 I had this year with my manager the first thing I told her was what I wanted to do within the team this year. Writing all of my goals down (big and small) helped me identify the steps I needed to take to be able to achieve them. TIP: Give your goals a due date. Divide them into short and long-term goals and figure out a plan to achieve them. ANOTHER TIP: Focus on learning skills that will help you stand out in the office. Not every day is going to be a great day, it might not even be a good one. But the type of day we have has a lot to do with the energy we put out. Each of the tips included impacts your energy at a different level and in a different way. Combine them as they benefit you the most to make your 8 hours at work, be hours that you enjoy. Keep in mind that staying inspired can be a mental thing that can be adjustable, but hating your job or career path is not. If you are constantly trying to find new ways to like or stay inspired/motivated at work and nothing works. Maybe is time to start looking for something that will bring more joy to your life. If you found this post helpful, share it on Pinterest so others can find it as well.